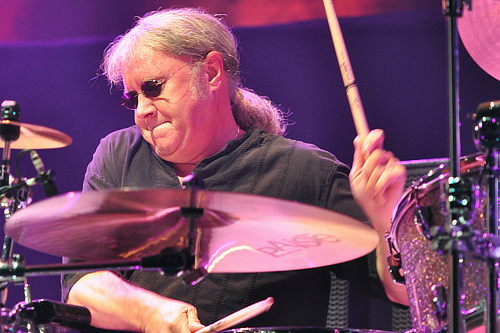 Ian Paice is one of the musicians confirmed for the Buddy Rich memorial concert to be held on the 25th anniversary of jazz legend’s passing, April 2, at the London Palladium. The show will feature members of the US-based Buddy Rich Big Band reinforced by prominent session musicians from the UK. Other musicians confirmed are Dave Weckl, Gregg Bissonette, John Blackwell, Gavin Harrison, Elliott Henshaw, and Tony Christie. The event will be co-hosted by Buddy’s daughter Cathy Rich, who will present Lifetime Achievement Awards to “three rock legends”. Tickets £30-£60 are available through seetickets.com. Posted by Nick Soveiko on Friday, February 17th, 2012, filed under News. You can follow comment on this post through the RSS 2.0 feed. You can leave a comment below, or trackback from your own site. Hope they film and televise it. Mr. Paice is the perfect choice to participate in this event. His style has the evidence of Buddy Riches influence. Glad he got to be involved in this. Just another example of the class act within the membership of the great band Deep Purple. So many of the great rock drummers in the rock music genre are really jazz drummers, who enjoy playing a little harder for a while in their rock music careers. Ian Paice, Bill Bruford, Barrie Barlow, Simon Phillips, Carl Palmer, Ginger Baker, Rod Morgenstein, Neil Peart, Phil Collins & many more no doubt, that I haven’t mentioned here. Speaking of Peart, he has already been here with the Buddy Rich tribute thing back in the 90’s, if my memory serves me well. Heaps of wonderful drummers playing respect to the drummers of ‘modern’ jazz, who have influenced so many drummers over the decades & will continue to do so! I don’t think Paice was involved in Peart’s original Rich tribute, so this is well deserved indeed! Two of his primary influences were Buddy Rich and Gene Krupa. You can hear it. Ian is of strong jazz influence. That really is something I would love to see. Ian Paice has told many times, that one of the greats was Buddy Rich along with Gene Krupa. In Deep Purple you can still hear influences from Buddy Rich in Paice`s groove! There is no other rock drummer who deserves honour to play event like this! There is no doubtining this will be filmed. But hope to see it is all we can expect to have… please. So far his name looks to be far above the rest revealed. That is the way it should be, for once! @ 2 MacGregor: glad you namechecked Barriemore Barlow, one of my all time fave drummers, awesome on all Tull-albums he played(Heavy Horses a personal favourite)!! Sami, yes Barlow is a classic drummer, like no other drummer with his style & 70’s Tull is some of the best rock music ever, period! One of Blackmore’s favourite bands is the mighty Tull! Saw I.P. at the Buddy Rich Tribute concert in Tamworth a couple of years ago and that introduced me to Pete Cater, a superb jazz drummer who has his own Big Band and annual Buddy Rich tribute concert, and who also headlined alongside Paicey. Got my tickets for the Palladium show and cannot wait! – Nobody plays like Buddy Rich!